Still searching for ways to climb out of my recent breakfast rut, I’ve been on the lookout for ideas. I knew I was on to something when I stumbled across the exotic sounding ontbijtkoek – a Dutch spice bread. There are three things that immediately caught me attention. 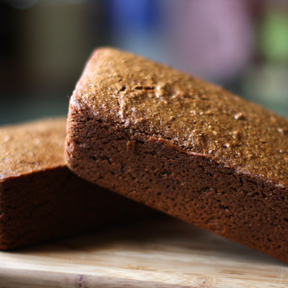 1) Ontbijtkoek is traditionally made with rye flour. 2) It also involves honey. I love baking recipes that use honey – especially when it is combined with rye. You might as well just pass me the butter right now. 3) It literally translates to “breakfast cake.” Sign me up. Other selling points include that it calls for a healthy dose of my favorite winter-warmers: cinnamon, nutmeg, cardamom, and clove. Plus there’s fact that it’s quick. And dish friendly. One mixing bowl, one spatula, one loaf pan. Of course I had to complicate things by baking mine in three little mini-loaf pans. They’re so cute, I couldn’t resist. I rationalized that it would be handy to stick a loaf or two into the freezer for future breakfast pick-me-ups. I learned from Wikipedia that several parts of The Netherlands have their own local recipe, of which the most famous is “oudewijvenkoek,” a variety that is mostly eaten in the northern regions. Oudewijvenkoek translates to “old hag’s cake” – which I found amusing, but a little more research taught me that it is traditionally flavored with aniseed. I wasn’t sure I wanted to go there for breakfast. Too licoricey. I found a handful of recipes for ontbijtkoek and ended up taking the bits and pieces I liked best from each to make my own version. Apologies to the Dutch if I have gone and ruined their traditional breakfast cake in doing so. But this much I can tell you – it is perfect with a strong cup of coffee. It’s chewy and warm and toasty. But don’t limit it to breakfast. Try it for elevenses and afternoon tea too. It’s marvelous lightly toasted with a spread of cold butter. Or if you want to get especially European about it, try it topped with a mild chev. Now there’s a combination that will send the breakfast blues packin’. Combine the dry ingredients together in a large mixing bowl. Make a well in the center and add in the liquid ingredients. Stir until just combined. Pour into a greased loaf pan and bake in a 300ºF oven for 50 – 80 minutes, depending on the size of your pan(s). This is a moist bread, so you really want to be sure it is completely cooked through. 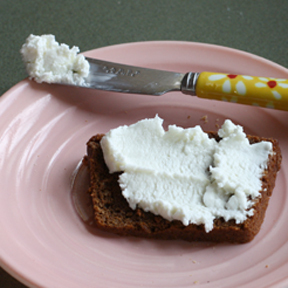 Serve warm or lightly toasted with butter or chev. Makes one loaf, or 2 -3 mini lovaes.